The project was initiated because users were frustrated with the long journey from home screen to a friend’s favorite restaurant list. Yelp is a mobile and web application that helps users find local businesses. 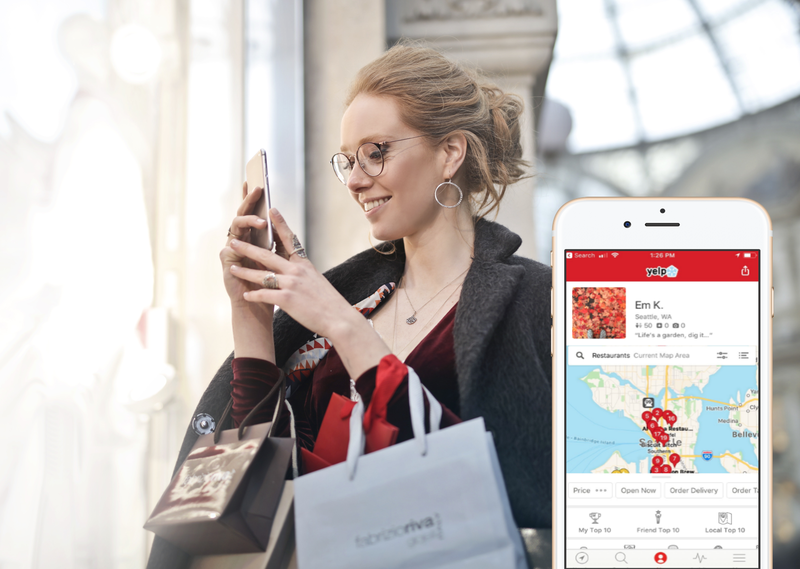 It is also a platform where users are able to find events, talk with other Yelpers, and find, rate, and review businesses. Yelp identifies their target audience as 20-50-year-old urbanites on their local audience page based on high intent local search behavior. Research and UX designer of app home page redesign. 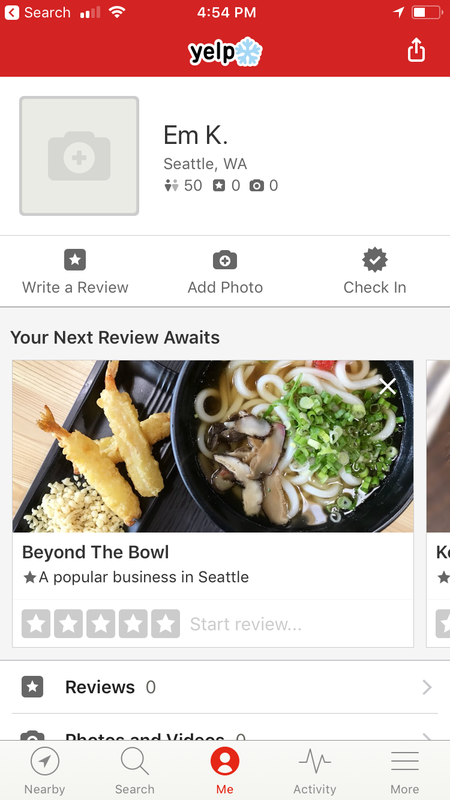 On the Yelp mobile app there are many ways to search by map via the navigation tab but not from the home screen. If you want to view a friend’s favorite restaurants you need to go to their page and access that information through their reviews. This can be a long, time-consuming journey with 4 or more clicks to get to a friend’s reviews and then sift through to find their highest-rated businesses. At the time of my research, no friend favorite restaurant list existed. I simplified the user journey by providing access to friend top 10 lists on the new profile home screen map. As part of my SVC prototyping class, I worked on a team of students to help Yelp users engage with several aspects of the mobile application. 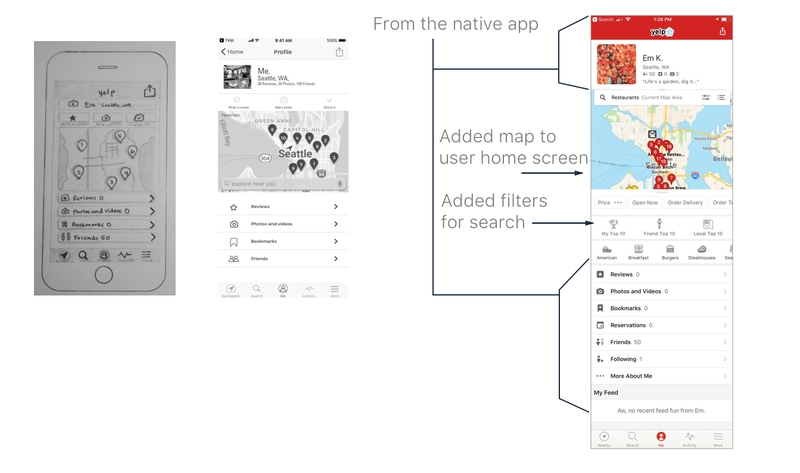 My role was to redesign the Yelp home screen to simplify a user journey. By the end of the 5-week project, I redesigned the Yelp home screen to search for a friend’s favorite restaurants on the home screen. The home screen also included a way to interact within the user’s geographic location through a map with filters. Our approach to the problems started with team affinity diagramming. Through affinity diagramming we identified discovery, reviews, service, incentives, and social as categories that each aspect or action fell under. We further prioritized the user and business information to define the most important components of the application. Through this technique, we discovered patterns and stress points in the application. An opportunity I identified was with the discovery and social categories to find a recommendation from a friend more quickly within the application. 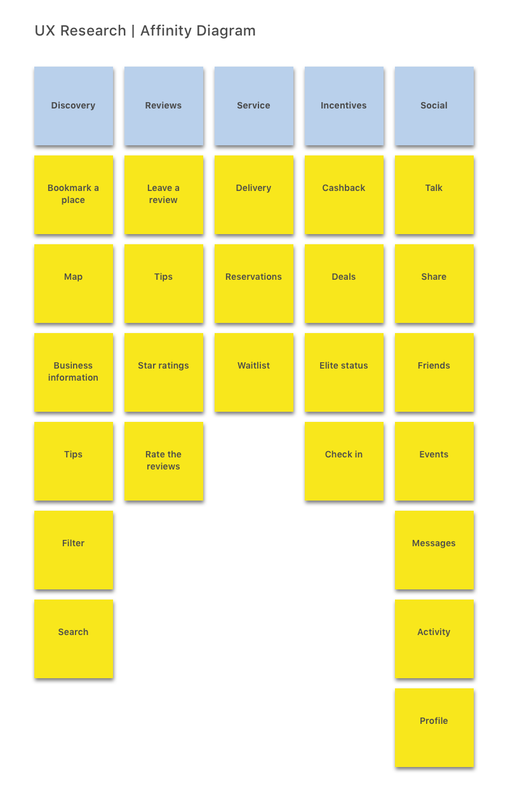 We also conducted competitor analysis and dove into quick paper prototyping. This was the right approach to review complex strings of data to make sense of them. Guerilla testing was a fun way to test paper prototypes rapidly to find out what was and was not working. I proved myself wrong when I started redesigning the user journey from end to end. Talking to users was an ah-ha moment for me. What users wanted was to be able to filter on the home screen eliminating that journey. Writing participant and recruiting screeners was a huge learning experience. 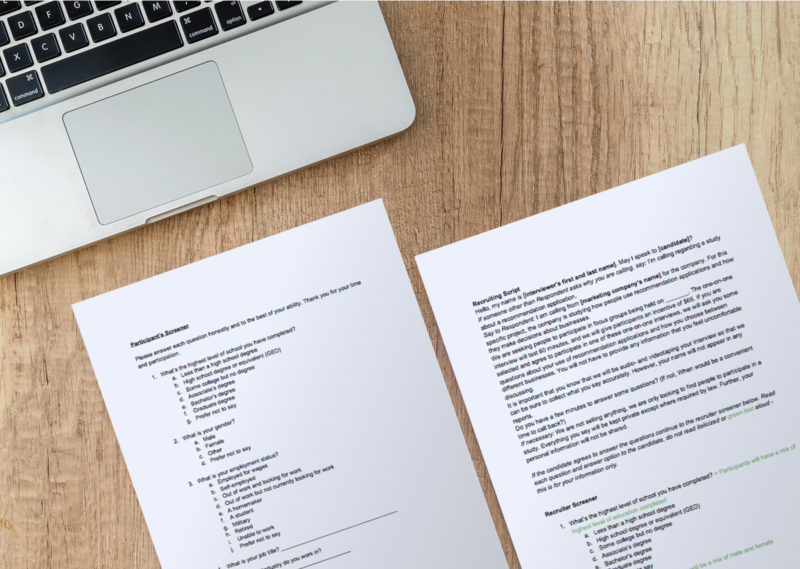 I also included a usability study script with a walk-through scenario for prototype testing. The most challenging part of the project was our ambiguous problem. We highlighted 5 issues as a class and then began a solo solution to one of those problems. We approached this challenge as a team in discovery to use our collaborative power. We got to the heart of what we thought were the most important problems to address. This helped us jump into ideation and start prototyping as fast as possible to test our ideas. The project concluded with usability studies using an Invision prototype. The feedback from usability studies informed design changes in my current prototype here. My redesigned home screen received positive customer feedback. From users I tested with they said they would love to see this home screen and new filtering feature on the Yelp app. If I could, I would focus more on contextual interviews at the beginning of the process. This is where I could learn more about the problem space. In the future this would inform my designs to get me to a more viable solution earlier in the process. In usability testing, users were able to explain what they’d find from the home screen and able to find the top 10 filters without issue.